The International Building, located on Fifth Avenue between 50th and 51st streets, is known for the seven-ton bronze sculpture of Atlas that stands at its entrance. 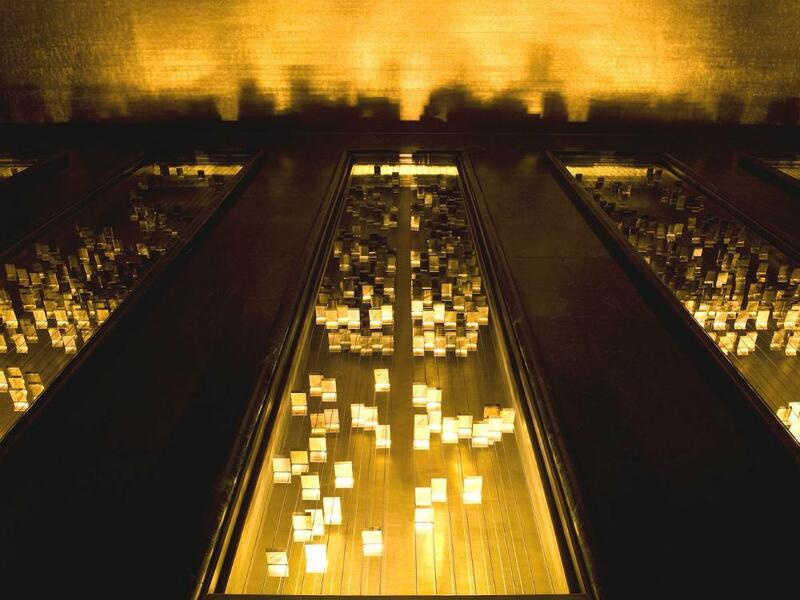 But what you may not realize is that just inside the doors is one of Rockefeller Center’s most magnificent—and often overlooked—sculptures: Light and Movement, by the Japanese-American artist Michio Ihara. Commissioned in 1978 by Nelson Rockefeller, Light and Movement is at once delicate and massive: comprised of ten 35-foot-high recessed panels, the sculpture spans the entire length of the north and south walls of the lobby. Within each panel, gilded-metal leaves are attached in varying distances (some are close together, others are spread apart) to vertical stainless-steel cables. As light from below reflects off them, the leaves appear to hover gracefully in the air, casting shadows and patterns against the illuminated golden back walls. As a result, the entire piece appears to gently shift and move as the viewer walks the length of the hall. This kinetic effect, the impression of movement within form, is a hallmark of Ihara’s work. By the 1970s, Ihara was using his art to explore his interest in “time as a creative element allowing change and motion; and nature, combining forces of light, wind, heat and manpower for constructive ends.” If his pieces didn’t actually move with the elements—many do in fact shift with the wind—they often appeared as if they could. As his fame grew, so did his commissions. To date, his sculptures have been installed along walls, suspended from ceilings or built outdoors (such as Auckland, New Zealand’s Wind Tree), in hospitals, office buildings, airports, universities, churches, hotels and public spaces across the United States, Japan, South Korea, Singapore, Taiwan, Hong Kong, Australia and New Zealand. Today, at age 85, Ihara continues to create art at his home in Concord, Massachusetts; his large pieces can take years to complete, what with the pitching, designing, collaborating with engineers and architects, manufacturing and, finally, installation of the work. But it's all worth the wait from Ihara, who remains one of our greatest architectural sculptors.